home / Multimedia / The Holy Land in news / Emergency in the Gaza Strip: your aid is needed to help support ..
ATS pro Terra Sancta is following with great concern the evolution of the situation in the Gaza Strip, fearing the repeat of a tragedy like the one four years ago – Operation “Cast Lead”, which caused around 1,300 deaths –with the local population once again in the direct line of fire. Within the Christian community – a very small minority of about 2,500 Christians currently live in the Gaza Strip – there is great fear and tension. Two days ago the long and persistent Israeli-Palestinian conflict, which for years has weighed heavily on the inhabitants, once again worsened. The members of the Religious Family of the Incarnate Word have had a permanent presence in Gaza for nearly four years, but their mission there began about eight years ago. 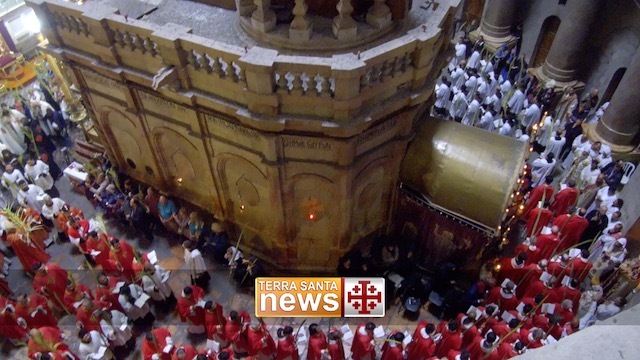 The priests serve the only Catholic parish in the Strip – one of the fathers is director of both of the schools in Gaza operated by the Latin Patriarchate of Jerusalem. The sisters work together with the priests in their mission with the children, youths and Christian families. They take care of the parish sacristy and assist with the liturgy at the Church of the Holy Family. As the sisters explain, in Gaza there is a small Catholic community, of about 200 souls, who seek to live their Christian faith in a simple and devout manner. It takes just a simple gesture to help the disabled, the children and families living in the Gaza Strip and to support the religious in their delicate mission that in these days more than ever consists in accompanying the Christians, in providing them a word of comfort and hope, in aiding them to ask God for instruction in forgiveness and the value of suffering, lived in a Christian manner.